Bake for 35-40 minutes at 375 degrees, or until golden brown and set. Allow pies to sit for 10 – 15 minutes, cut into 8 slices and serve. NOTE: These freeze well once baked; be certain that crust is not over-browned. Let cool, as above, cut into portions, wrap with plastic wrap and then cover with aluminum foil. Defrost overnight; reheat at 350 covered with foil only until hot. Add remaining ingredients, except for red pepper, and fully incorporate. 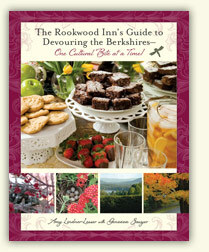 The Rookwood Inn’s Guide to Devouring the Berkshires – One Cultural Bite at a Time is the quintessential arm chair traveler’s guide to the arts in the Berkshires of Western Massachusetts. 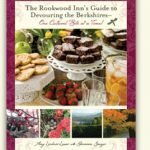 Divided by seasons to take advantage of locally grown and sourced foods, each chapter has a general introduction to the season, a blurb and recipes from some of the cultural venues, along with Rookwood Inn recipes. It is available for purchase from the inn. Profits go to the Stephen Lindner-Lesser Memorial Foundation which supports cultural organizations in the Berkshires.